When it comes to bulk printing, the Konica Minolta Magicolor 4690MF is reliable choice. To make it more efficient, the manufacturer integrated fax, copy, and scanning features in one large package. However, its hefty price tag and large size might make users want to look for other options in multifunction printers. This printer is heavy at 121.3 lbs; it measures 21.2x23.2x22.8 inches (W x D x H). Maximum resolution is 2400x600 dpi; the Super G3-compatible fax machine transmits messages in as fast as 33.6 Kbps. The Konica Minolta Magicolor 4690MF can be easily integrated into a network via Ethernet 10 Base-T/100 Base-TX. 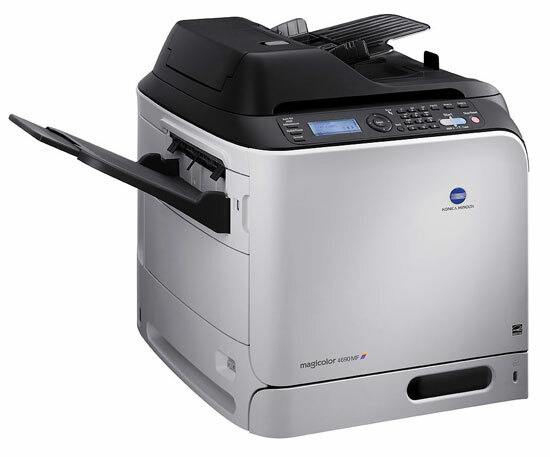 The Konica Minolta Magicolor 4690MF is a speedy laser printer that can do 25 ppm in colour and black-and white. It is quiet, so it does not interrupt activities, and has an automatic document feeder capable of double-sided printing. Users rave about the excellent print quality. The Konica Minolta Magicolor 4690MF is also user-friendly and easy to operate. The automatic duplexer is only limited to 50 sheets at a time, which can be a hassle for high-volume print jobs. The scanner's resolution is limited to 600x600 dpi, while the bulky body of the printer requires a lot of room. The Konica Minolta Magicolor 4690MF uses too much toner in 'standard' mode. The fax machine has no handset, making it reliant to a PC. The Konica Minolta Magicolor 4690MF's power consumption is high at 1250 Watts during operation, 25 watts when sleeping, and 200 watts in standby mode.